Palazzo Vecchio, Florence. 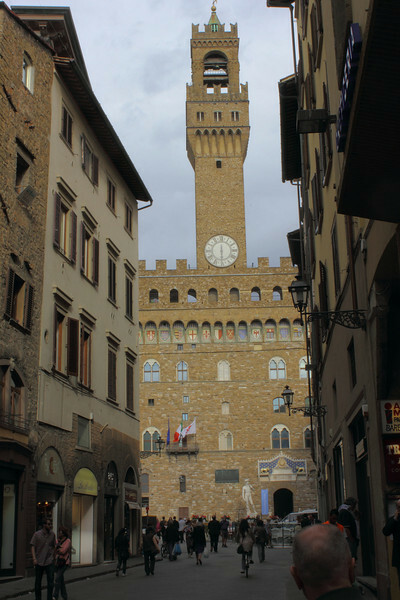 From Wikipedia: The Palazzo Vecchio ("Old Palace") is the town hall of Florence, Italy. This massive, Romanesque, crenellated fortress-palace is among the most impressive town halls of Tuscany. Overlooking the Piazza della Signoria with its copy of Michelangelo's David statue as well the gallery of statues in the adjacent Loggia dei Lanzi, it is one of the most significant public places in Italy. In 1299 the commune and people of Florence decided to build a palace, worthy of the city's importance and giving greater security, in times of turbulence, to the magistrates. The tower contains two small cells, that, at different times, imprisoned Cosimo de' Medici (the Elder) (1435) and Girolamo Savonarola (1498).